GlobStrat_Triple Bottom Line, integrates Sustainability and Social responsibility...for MBA. GlobStrat_Business, ideal for team building in a management training introduction. Join the Fortune 500 firms and leading academic institutions already using GlobStrat and challenge yourself: Are You CEO-ready? GlobStrat is a strategic simulation that exposes participants to all major corporate functions: R&D, Manufacturing, Sales, Marketing, HR, Finance and Strategic Alliances. Success requires sound theory, smart strategy and faultless implementation. 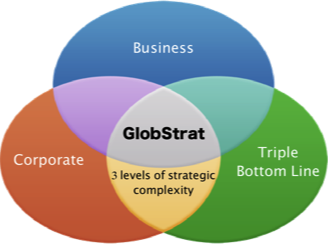 GlobStrat provides a dynamic business environment where participants are immersed into a virtual, yet very realistic business environment. Direct competition makes for intelligent opposition and epic battles. GlobStrat's simulation engine is built around state-of-the-art economic models. All strategic arenas can be explored and implemented. With no pre-defined winning strategies, GlobStrat offers an ever-renewed experience. GlobStrat has been designed to teach multiple levels. Whether MBA or undergraduate, seasoned or junior executives, GlobStrat's breadth and depth can be easily configured to match your needs. HEC-Montreal) and Fortune 500 firms. GlobStrat is entirely web-based, with zero installation. Through our training program, whether on-line or on-site, instructors are up-and-running in just a few hours. Success guaranteed - No hassles! Instructors even have access to a dedicated hotline for urgent matters. No matter what, we'll be here for you.